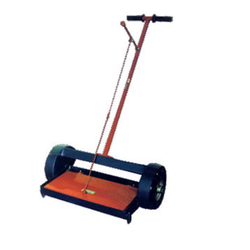 Leading Manufacturer of floor magnetic sweepers, magnetic floor sweeper and magnetic sweepers from New Delhi. 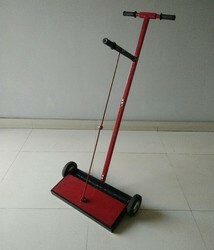 We are among the renowned manufacturers and exporters of Floor Magnetic Sweepers. These are very easy to operate as they can be easily navigated across the floor with the help of the handle. They have been fitted with rubber roller bearing wheels and are light in weight. Any sort of tramp iron can be easily removed by using this. We make these available in different variants that suit the needs of different customers. These have been competitively priced. 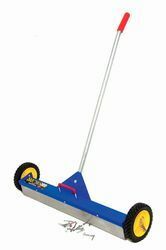 Magnetic Floor Sweepers model SRDL for collecting dangerous scrap metal, chips, nuts- bolts, nails etc scattered on floor, our quick release Magnetic Floor Sweeper features easy load release. To unload, simply take the sweeper to the desired dumping area and pull up the lever. It quickly released the accumulated iron / scrap. Available in 300mm, 450mm, 600mm, 750mm and 900mm sweeping widths. 38 inch long handle with 2 Nos., 5" diameter Rubber wheels. Strong magnetic field with 2" floor clearance. We are among the renowned names in the industry offering Magnetic Sweepers. These are utilized for cleaning tramp metal from industrial as well as public areas. These are characterized by a flawless design, easy maneuverability, light weight and long functional life. These are easy to use and require minimal manual effort. We make these available at standard market prices. These are made available as per the requirements of the customers. Looking for Floor Magnetic Sweeper ?